This review is spoiler-free and suitable for all audiences. This was one of the films I talked about wanting to watch in this post. So far, I’ve previously reviewed Into the Forest and Annihilation from that original list. Coco is a 2017 film produced by Pixar Animation Studios and released by Walt Disney Pictures. It followed the adventures of a young boy named Miguel who dreamed of becoming a musician one day against the wishes of his parents, grandparents, and other elders. They wanted him to follow in their footsteps and become a cobbler instead. This conflict between Miguel and his elders not only provided the catalyst for his adventures in the Land of the Dead, it asked a lot of thought-provoking questions about how far someone should go to pursue their dreams and what sorts of things it should be okay for a family to ask one member to give up for the sake of everyone. This movie had an incredibly large cast of characters in large part because Miguel was part of a massive extended family that included generations of people who died long before he was even born. Mentioning certain characters would also make it difficult for me to avoid spoilers, so I will only be talking about the most important ones who can be discussed with giving away any plot twists. The introduction to this film did an excellent job of explaining who everyone was and how they were related to each other, though, so you shouldn’t have any problems catching up on the secondary characters I didn’t include in this post. Miguel, the protagonist, was a 12-year-old boy who was caught between his dreams and what his elders wanted him to do with his life. 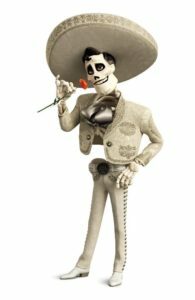 On Dia de Los Muertos (Day of the Dead), when the dead are allowed to come visit loved ones who remember them during this Mexican celebration of loved ones who have died, Miguel accidentally crossed from our plane of existence to the Land of the Dead. In order for him to return to the Land of the Living, he had to receive the blessing of one of his dead relatives before the sun rose again. If he failed, he’d be trapped there forever. Dante, Miguel’s dog, was his mischievous and occasionally silly pet who accompanied him to the Land of the Dead. This character was responsible for almost all of the humorous moments in the plot thanks to the fact that he wasn’t a particularly bright dog and he didn’t always think through his choices ahead of time. I’d love to see a sequel starring him someday. Coco was Miguel’s great-grandmother and the oldest living member of their family. She’d been abandoned by her father, a musician, as a small child, and the pain of that experience was something she’d carried with her for her entire life. It was this story that made the rest of Miguel’s family so opposed to his desire to become a musician. Abuelita was Miguel’s grandmother, Coco’s daughter, and the head of the family in the Land of the Living (or what we would think of as our world). No one made any major decisions without getting her blessing first. Mamma Imelda was Miguel’s great-great grandmother. Coco was the daughter she’d been left to raise on her own after her husband went away and never came home again. She still resented her husband for that decision when Miguel met her in the afterlife and asked for her help to get home again. Héctor was a friend Miguel made in the Land of the Dead. He lived in a section of the afterlife that was reserved for people who were no longer being honoured by the living on Dia de Los Muertos. If he couldn’t find a way to get the living to remember him before the last person who had known him in life died themselves, he would disappear from the Land of the Dead forever. What happened to dead people who were completely forgotten was unknown. Ernesto was the man Miguel believed to be his great-great grandfather. He was never honoured, remembered, or even mentioned by the Rivera household due to how poorly he’d treated his wife and child, but the songs he sang while he was alive ensured that other people remembered him on Dia de Los Murtos and kept him going in the Land of the Dead. Ernesto was a talented musician whose songs were still sung decades after his death in our world, The Land of the Living. Everything I’m about to say about Coco will be complimentary. I normally try to sandwich my criticisms between compliments, but in this case I wouldn’t have changed a single thing about this film. It was exactly what I was hoping it would be. The storytelling was beautiful. While this was marketed as a children’s movie, I’d honestly recommend it to adults just as much, and maybe even a little more, as I would to the age group it was actually intended for. Miguel’s family was large, but I felt like I got to know each character in it well due to how much time they spent exploring their complicated relationship with each other and their shared pasts. They dealt with serious issues that many people face. There were a few emotional scenes about death and regret that would almost certainly fly over the heads of the youngest viewers, but they meant a lot to me as an adult who has faced similar conflicts myself. One of the things I love the most about Pixar films is how well they straddle the line between appealing to adults while also writing something that children will find meaningful. Once again, they did a fantastic job of speaking to both groups without talking down to the kids or simplifying anything for older viewers. Mama Imelda, Coco, and Coco’s father in a family picture. I didn’t grow up in a family or a culture that observes Dia de Los Muertos, so I really appreciated the attention to detail when Miguel and his family were preparing for and then later celebrating it. There was something beautiful about seeing the alter Miguel’s elders had set up with photos of their deceased relatives and offerings of food and other things that the dead would have enjoyed. Yes, there were moments of grief, but there was also a lot of love and joy in that tradition. It seemed to me that it was about remembering the good times with people who have passed on and sharing your happy memories of them with the next generation. Some of the elders in my family have historically been a bit resistant to the idea of telling stories like this as a coping mechanism for grief, so I found it refreshing to see a family speak so openly and fondly of the dead. It struck me as something that could be much more emotionally healthy for people who found themselves missing a parent, grandparent, or other relative who is no longer part of the Land of the Living no matter how many years ago they’d crossed over. The conflicts in this story were written in such a way that I could sympathize with both sides. Of course Miguel wanted to explore his musical talents and learn how to be a better musician. On the flip side, of course his elders would be horrified at the thought of another family member abandoning them to make music. This was a case when there was no right or wrong answer and I could imagine Miguel and his elders changing their opinions if their places could somehow be reversed. The best scenes happened after Miguel crossed into the Land of the Dead and finally met the relatives there he’d been honouring his whole life but had never actually known when they were alive. I enjoyed seeing the tension build between this character’s individualism and his ancestors’ collectivistic understanding of how a life should be lived. It was a nice reminder of how a culture can change from one generation to the next, and it also provided a lot of fodder for conflict as Miguel tried to figure out how to get home before sunrise. I was also impressed with the music. Every single song was something I’d love listen to again, especially when it came to “Remember Me.” For those of you who have seen a lot of animated films, the music in this one reminded me of classic Pixar songs like “You’ve Got a Friend in Me” from Toy Story. Not only were they meaningful for the storyline, they were nice pieces of music in and of themselves. I could see myself adding several of them to the list of songs I listen to every day, and that’s not something I do very often. Yes, you absolutely should. I’d heartily recommend Coco to audiences of all ages with no caveats. 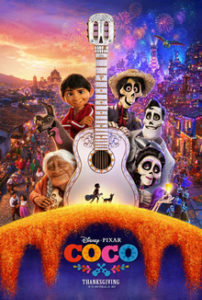 Coco is avaliable on iTunes and Netflix.